Sue and I are excited to be sharing this light and tasty dessert with Nichi’s readers here at The Mandatory Mooch. Sue and I started our blog, http://joandsue.blogspot.ca/, about a year and a half ago and not long after we stumbled upon The Mandatory Mooch’s Tasty Thursday’s Link Party. We have been following ever since. 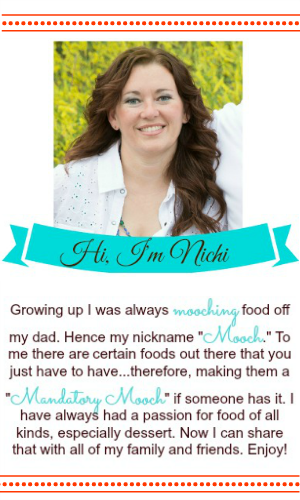 When Nichi said she was looking for bloggers to guest post on her blog, we jumped at the opportunity. Sue and I are twins in a small Canadian town located in the mountains. 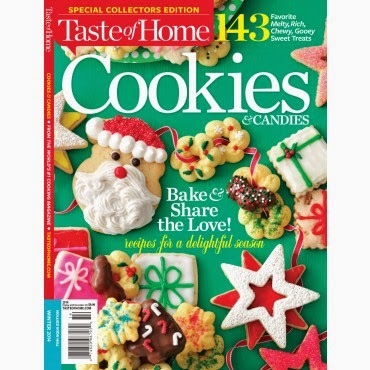 Our blog is a chance for us to share our favorite recipes and stories. We hope you will stop by and say hi. For now though, we wanted to share a recipe that is fairly easy to make, looks impressive, and tastes super yummy. 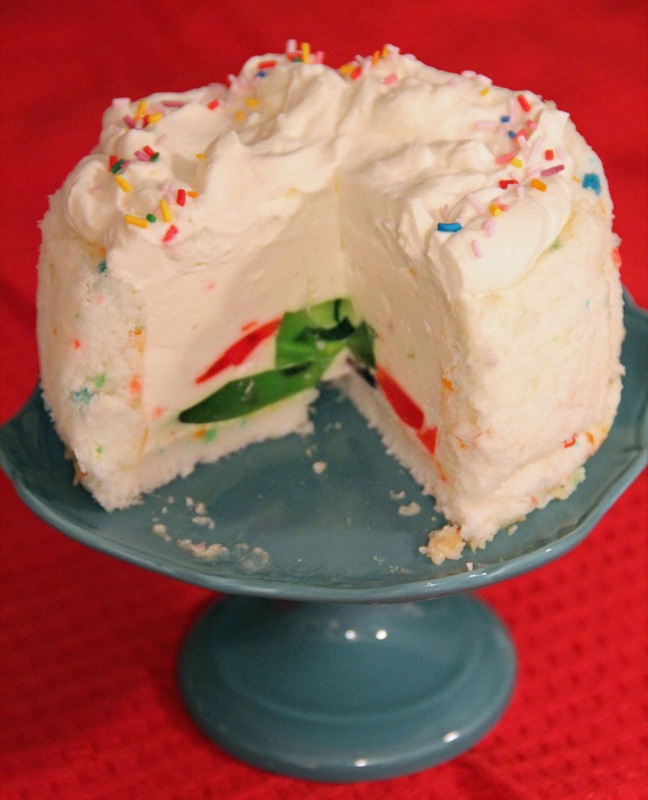 We decided to put a twist on the classic combination of cake, Jello, and whipped cream by putting them all together in a fancy schmancy cake. Preheat oven to 350. 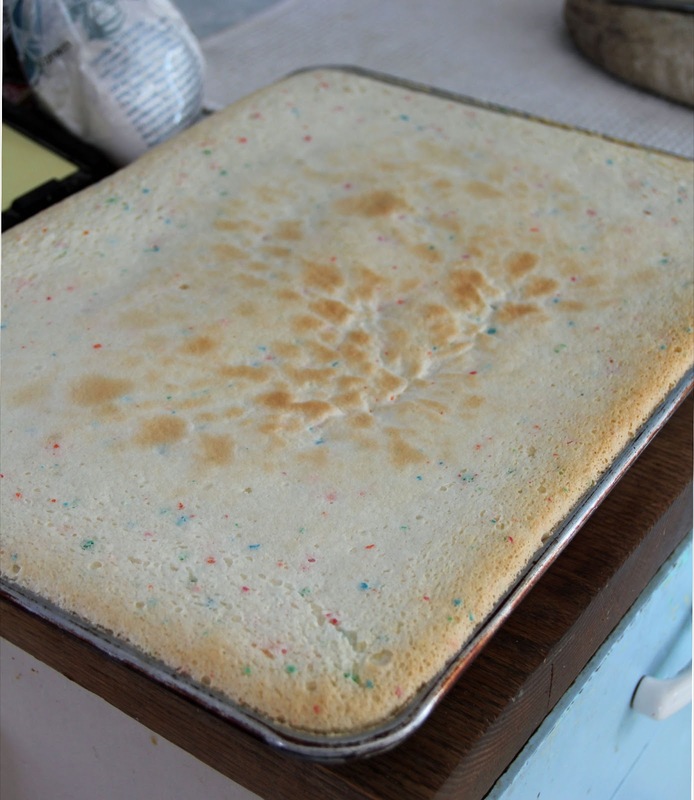 Line a 15 X 10 cookie sheet/jelly roll pan with parchment paper, set aside. Prepare Angel Food Cake as per box instructions. Spread evenly in prepared pan. Bake at 350 for 15 - 20 minutes, until cake is evenly browned. Remove from oven and let cool about 10 minutes. Run a knife gently around the edge of the pan. Place a large, clean tea towel on a flat surface. Sift the icing sugar over the towel to cover evenly. 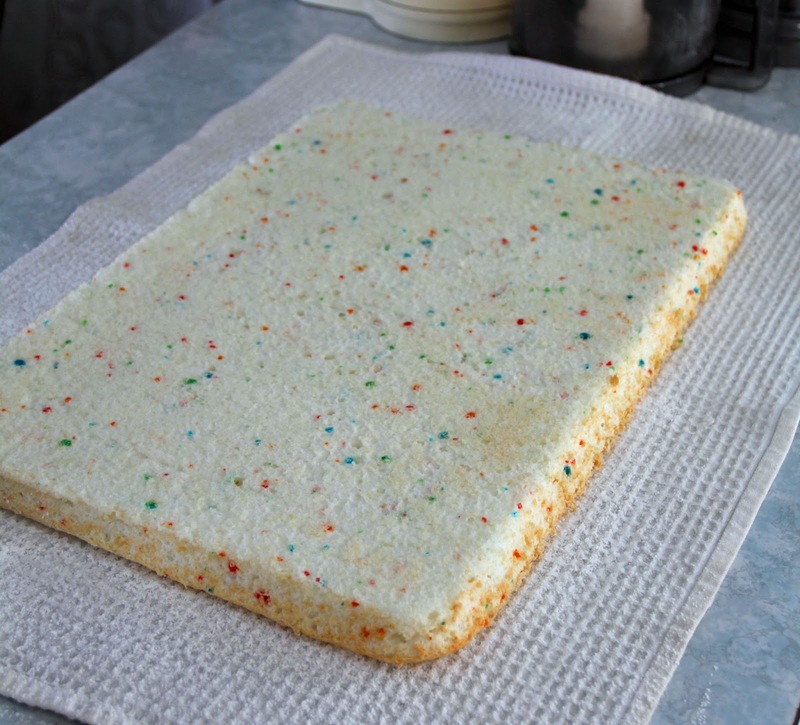 Gently flip Angel Food Cake onto the sugar covered tea towel. Place an 8 inch spring form pan gently on top of the corner of the cake when it is cool. 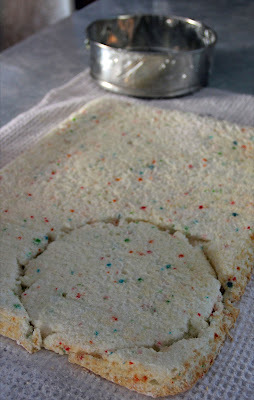 Run a serrated knife around the pan to cut out the cake to fit the pan. 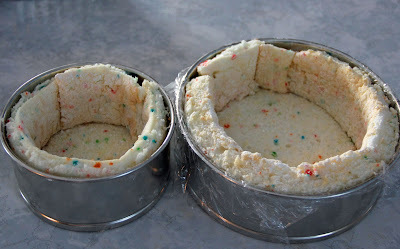 Cover the cake so it doesn’t dry out and set aside while you make the filling. In a medium saucepan, sprinkle gelatin over pineapple juice. Let sit 5 minutes. Place over medium heat and heat until gelatin is dissolved and mixture is smooth. Remove from heat and add the water. Transfer to a bowl and let cool slightly - chill about 10 - 15 minutes in the fridge so it is cold but not set. Whip the cream and vanilla until stiff peaks form. Whisk the pineapple juice mixture into the cream. Sprinkle the Jello cubes into the cream/pineapple juice mixture and very gently stir them in. Pour the mixture into your spring form pan. You can see from the above photo I used 2 smaller spring form pans. I couldn’t find my large one. Eeep! It’s okay, this will work in 1 large or 2 smaller. Now, just chill, covered, in the fridge until it is completely set up. I have always left it overnight for good measure. When ready to serve simply whip your remaining 1 cup of cream with vanilla and sugar until stiff peaks form and spread over the top of the dessert. 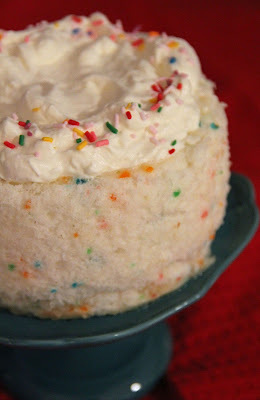 If desired, you can sprinkle a few sprinkles on top to add some more color. 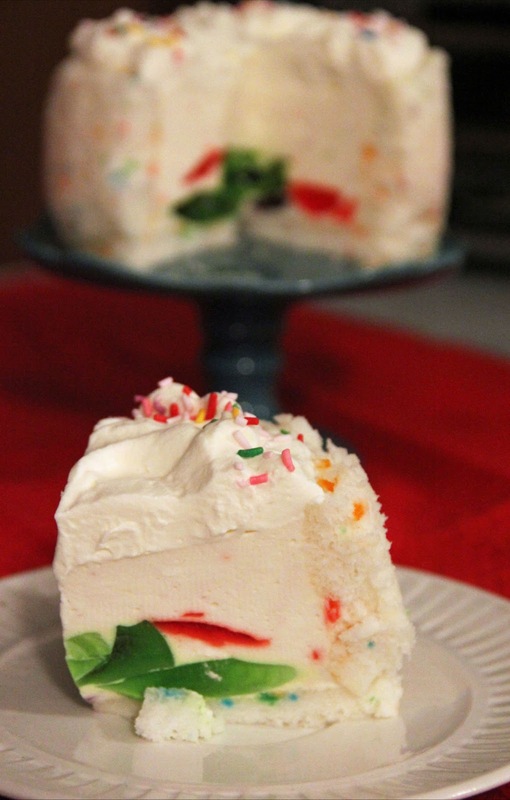 We hope you enjoy this dreamy Jello and Angel Food Cake dessert. 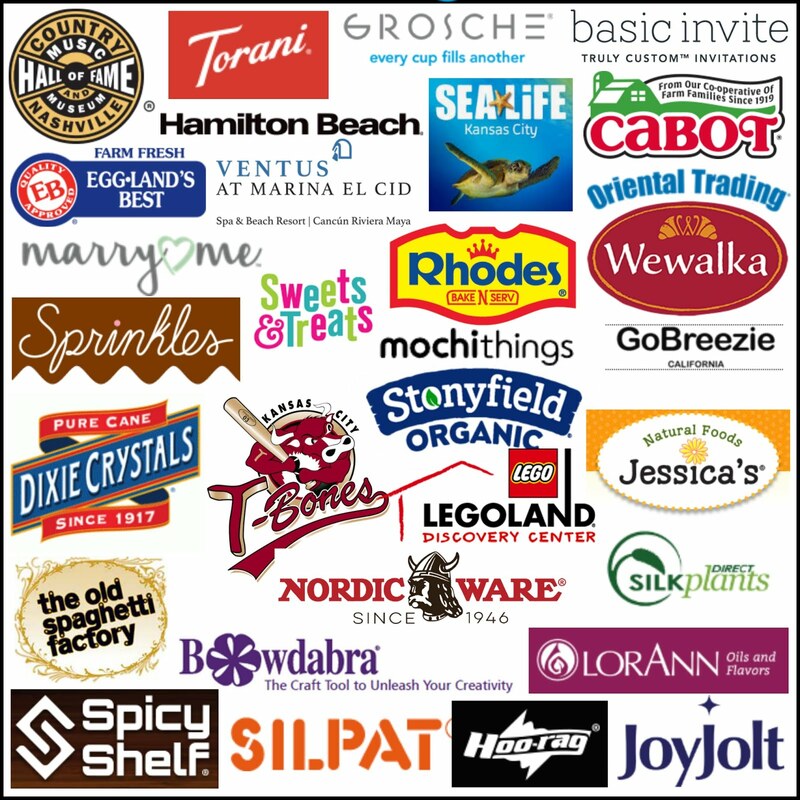 We would love for you to stop by http://joandsue.blogspot.ca/ and tell us what you think. Sue and I would like to thank Nichi for the opportunity to share with her amazing readers! 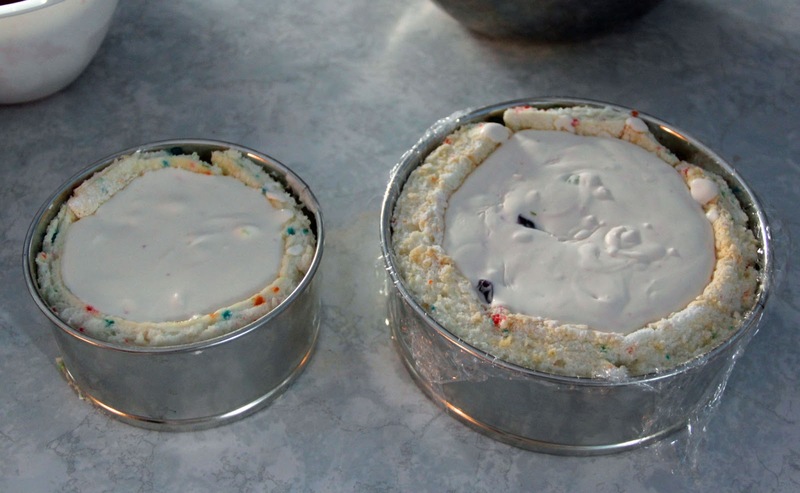 I like the fun prep method for your cake. Makes for something a little different!